The trial assessed the accuracy of anaesthesia clinicians in estimating an anaesthetised patient's systolic blood pressure (SBP) by feeling the radial pulse. To credit their accuracy to luck, skill or circumstance, the volunteer medical participants were sequentially randomized to one of four groups: one group given no help (control), the second allowed to feel the pulse, the third given pre- and peri-operative clinical information, the fourth given both. We set out to collect 60 estimates for each group (240 estimates). The accuracy of their estimations was assessed to clinical and statistical significance. Specific objectives were to determine whether palpation statistically improved estimation of SBP and whether it could be clinically useful. Irrespective of the level of training or self-confidence, the doctors in the study performed better statistically against controls and to within pre-determined clinical relevance ranges when they were allowed to palpate the radial pulse. The degree of accuracy was enhanced by giving pre- and peri-operative information to the extent that the participant clinicians were able to estimate the systolic blood pressure to within 30mmHg accuracy 96.7% of the time. Our results showed that a well-informed anaesthetic registrar or even consultant can accurately (within 15mmHg 80% of the time, within 20mmHg 86.67% of the time) estimate his/her patient's blood pressure by palpation of the radial pulse Clinical assessment of the patient's blood pressure by palpation is historically part of the nurse's and doctor's skill set. It was expected that the patient's SBP could be estimated to within 10 or 20mmHg most of the time and estimations more than 20mmHg wide of the mark were unacceptable [1,2]. Some clinicians still believe they can reliably estimate the patient’s arterial blood pressure by palpation. The trial set out to test this assertion, and find out to what extent luck and circumstance play a part in accuracy. We could find no previous studies on estimation of the anaesthetised patient’s blood pressure in this way. The few studies reaching publication support the accuracy of "the palpatory method" . Estimation by palpation achieves safe estimates at both the hypotensive and hypertensive ends of the spectrum, where inaccurate estimations could prove dangerous [1-3]. The palpatory method was found to predictably underestimate the SBP, allowing quantification of repeatable discrepancies between methods. Correlation with sphygmomanometry and age-related patient physiology led authors to suggest adding 5mmHg to the palpatory estimate in patients under 25, and adding 10mmHg to the palpatory estimate in patients over 66. Palpation publications disappeared until re-consideration as a broad aid to resuscitation in the ATLS recommendations of 2000 . Gone was any expectation of accuracy within 10mmHg of the early 1980s. Wide ranges in blood pressure were estimated by the presence or absence of the pulse at the radial, brachial and carotid arteries, in disappearing sequence in shock or hypovolaemic states. The authors concluded against the safe use of palpation in the emergency setting. Estimation of blood pressure has been considered essential since it came to medical prominence as a therapeutic target in the 1800s . Palpation of the brachial or radial pulse co-existed with sphygmomanometry so long as there was an expectation that the patient's SBP could be estimated by palpation to within 20mmHg, and to within clinically useful ranges on which to base temporary clinical decisions . Oscillometric technology changed the balance, making efficient and accurate blood pressure assessment widely available and affordable. Machines such as the Dinamap (used for the "true" measurement in this study) became cheaper and remarkably reliable [6,7]. Articles on palpation vanished. We lost the habit of using personal skill in temporary blood pressure estimation. II. Whether the anesthetist can estimate the SBP of his/ her patient by palpation to within a clinically useful range. The secondary outcome measure was the effect of detailed patient information on the accuracy of estimation, and whether practitioner confidence or experience has a bearing on accuracy. Wildly Inaccurate: beyond 50mmHg of the true SBP. This served the purpose of assessing bias from the effect of self-confidence or effort in attaining an accurate estimate, as well as potentially later selecting data of self-confessed "rogue" participants for sub-analysis or removal. 4. The combination of palpation and clinical history to the accuracy of the estimation, participants were randomly assigned to one of four groups in 1:1:1:1 ratio, with access to either palpation, history, both or neither in making their estimation of the SBP. The study was powered to accept a difference of 15mmHg accuracy between groups as being clinically significant, the power calculation indicating a sample size of 60 estimations would be required for each group. 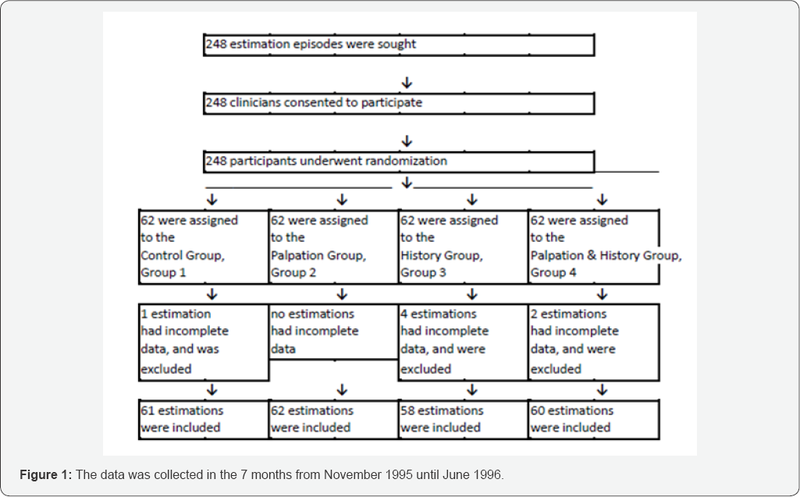 The investigator randomized 62 estimations per group (248 total), expecting a small attrition rate in complete data sets. The data was collected in the 7 months from November 1995 until June 1996 (Figure 1). The control group had access neither to palpation nor clinical data (Control, Group 1)	. The participants were randomized at the theatre door by the investigator. If allocated to this group, they were led into the theatre and asked to estimate the patient's SBP armed only with the unavoidable knowledge that the patient was an adult, under general anaesthesia, undergoing a surgical procedure. Dinamap readings were taken immediately prior to and after the participant’s estimation, the Dinamap digital read-out being concealed from the estimator by a folded piece of A4 paper. The practicing anesthetist in charge of the case needed to agree to the estimation taking place in their theatre on their patient, and had access to the Dinamap read-out at all times. Participants allocated to the second group (Palpation, Group 2)	were led into the theatre and asked to estimate the patient's SBP after palpation of the patient's radial artery for a maximum period of 60 seconds. Similarly, Dinamap readings were taken immediately prior to and after the participant's estimation, the average of these two readings taken as the True SBP. Participants allocated to the third group (History, Group 3) were led into theatre and given information by the anesthetist in charge of the patient. This included all relevant recorded medical information of the specific unidentified patient’s medical past history and current circumstances, the nature of the operation and its progress. They were given a detailed inventory of the drugs used to induce and maintain anesthesia, including pressors or dilators, their time and dose. No recent/current blood pressure measurements were given, although the recorded blood pressure at the pre-operative visit was provided. The participant was allowed to ask for any further information that might be helpful in their assessment, and then asked to make their estimate. No time limit was imposed on this group making their estimate. Participants allocated to the fourth group (Palpation & History, Group 4) were not only provided with all the detailed medical, surgical and pharmacological information of the patient's conduct of anaesthesia, but were also asked to palpate the radial artery of the patient prior to their estimate of the SBP There was no time limit in the divulging of clinical information. Once the participant was satisfied with the obtained history, they proceeded to palpation of the patient's radial artery for a maximum period of 60 seconds prior to making their estimate. The conditions of estimation in the Group 4 participants (Palpation and History) mimic those of the clinician conducting anaesthesia on a known patient, using palpation as a guide to SBP estimation. In all cases in all groups, permission to enter theatre and estimate the patient’s SBP, either by history, palpation, both or neither, was sought from the practicing anesthetist in charge of the case prior to the participant entering theatre. There were no refusals. No adverse events were perceived in any patient in any group during or after any estimation. No patient demographics were recorded, and no attempt was made to stratify patients by age, gender, co-morbidities, type or duration of surgery. Royal Perth Hospital is a tertiary referral teaching hospital, with patients reflecting that tendency to complicated co-existing disease. The targeted theatres conducted adult general, abdominal, plastic, urological and vascular surgery, all patients being under general anaesthesia to be eligible for the study. 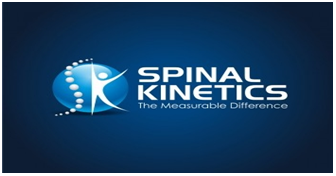 The "true SBP" was recorded as the average of two measurements taken on a Dinamap 8100 in current usage, serviced by Technical Services, Royal Perth Hospital, and assessed by Biomedical Engineering as functional and accurate. The first SBP measurement was taken immediately prior to the participant's estimate of the SBP, and a second measurement taken immediately after the recording of the participant's estimate. The two measurements were then averaged and recorded next to the participant's estimate as the "True SBP". The difference between the participant's estimated SBP (ESBP) and this "True" SBP (TSBP) was recorded as the "Error". Data were analyzed using PASW Statistics 18.0 for Windows Chicago IL to produce descriptive statistics, histograms and box-and-whisker plots. The continuous variable was the error (ERROR) in estimating the SBP which was taken as the estimated SBP (ESBP) minus the true SBP (TSBP) the average of the pre-and- post estimated Dinamap readings. Group 1 exhibited significant non-normality with a p-value of 0.023 as provided by a Shapiro- Wilk test carried out in MINITAB Version 15.0. All other groups were considered normal. The skewed and more variable Group 1 precluded reporting of any meaningful straightforward One way ANOVA, albeit useful robust Levene tests for homogeneity of variance were afforded, using PASW. At the suggestion of an editor, and since the variable ERROR is yielded as a difference between pairs of variables estimating the same quantity, a variant of the Bland-Altman plot, allowing for GROUPS to be identified, was programmed in the free software package R version 2.13.1. This ultimately leads to further dissection of the data into areas of Clinical Relevance, from which we report chi- square tests using a Casio fx-9860G AU Graphics Calculator. The ERROR in estimation accuracy was assessed for each group and the ranges of accuracy compared between groups to determine which conditions afforded the most accurate estimates. The Group 4 data were analysed to assess clinical accuracy and utility of palpation under conditions of usual anaesthetic practice. 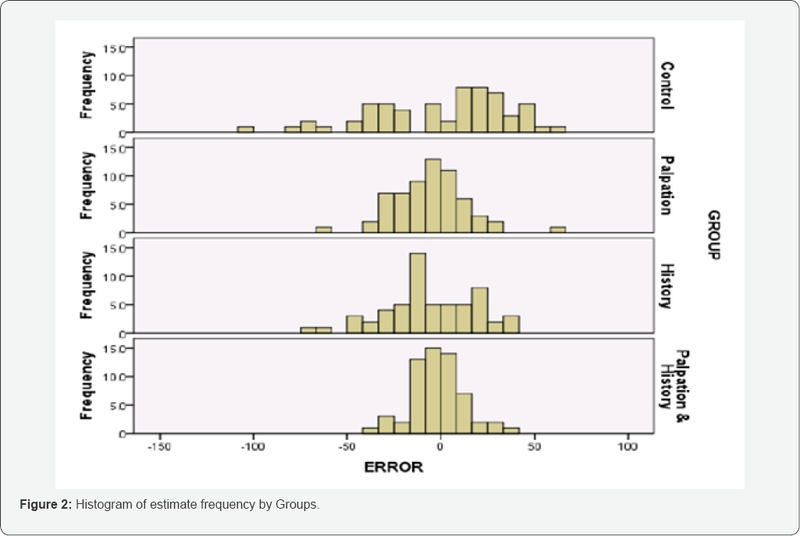 Histograms of the frequency of estimation accuracy for the variable ERROR for each of the four groups follow (Figure 2). The histograms illustrate the distribution of the data around the "0" error (Estimated SBP-True SBP = 0). The Control group has greater dispersion than the other groups. The palpation groups appear more clustered around the True SBP (accurate) than the groups without palpation. The most tightly clustered set of data appear to be in the Palpation and History group, where there are no outliers. The skew nature of ERROR for the Control group is observable and this corroborates the Shapiro-Wilk test reported above. All other groups reflect normality (Figure 3). 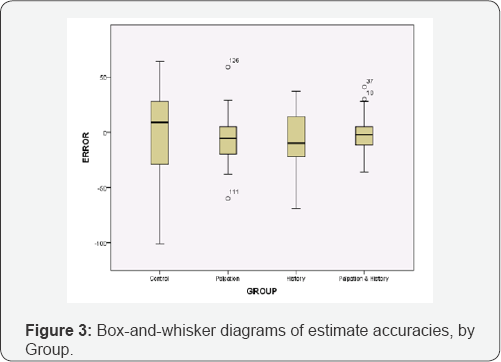 Side by side box-and-whisker plots demonstrate the higher location of the median of the ERROR value of the Control group, over-estimating the true SBP, than the medians of the other groups. More importantly the Control has an increased variance. The Levene test for homogeneity of variances, applicable in situations of non-normality, gave a p-value of less than 0.0005, suggesting that the variances are non-homogeneous. Individual pair-wise comparisons using Levene's test showed that only groups Palpation (Group 2) and Palpation & History (Group 4) have comparable variances (p-value = 0.06007), the variance of History (Group 3) being higher than these two (p-value G3 vs G2=0.03356 and p-value G3 vs G4=0.000096). This answered the first primary end-point, palpation did statistically significantly improve accuracy of SBP estimation. Brief palpation was also associated with superior accuracy in SBP estimation than history obtained with unlimited time, the variance of the Palpation group (G2) being lower than that of the History group (G3) (p-value G3 vs G2=0.03356). History (G3) was associated with improved accuracy of SBP estimation over Control (G1), the variance of Group 3 being statistically less than the variance of the Control Group (p-value G3 vs G1=0.001444), demonstrating statistically significant less dispersion of the data (less error) when the clinician was made aware of clinical information. The addition of palpation to the already available history also statistically reduced the variance, improving the accuracy of estimation even more (p-value G4 vs G3=0.000096). 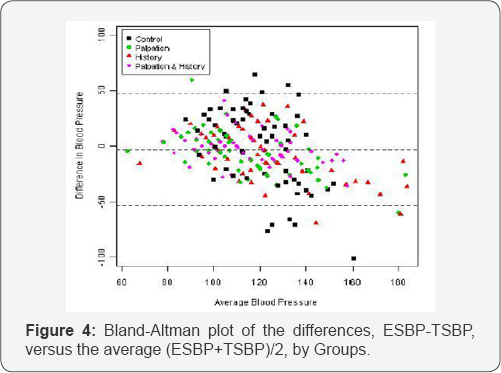 Assessment of the data was further carried out through a Bland-Altman Plot of the differences, Estimated SBP - True SBP versus the average (ESBP+TSBP)/2, with associated 2-standard deviation limits for the differences (Figure 4) . Just as the associated box-and-whisker plots revealed greater variation of the values in the Control group compared with all the other groups, we see from the plot that several points in this group were outside the 95% confidence limit of the plus-and minus 2 standard deviation lines. None of the blood pressure confidence limit. It can be seen that estimates for the History group (G3) tended to underestimate the true difference in that the differences tended to be negative for those with higher blood pressure. The second primary end-point was to determine whether the statistical superiority of estimation by palpation translates to clinical usefulness. The data was analysed to assess whether the proportion of observations or estimates falling in clinically relevant ranges is different for different groups. Statistically in the main we make comments based on chi-squared tests (based on 2 by 2 tables) to distinguish between two groups. For example, in Table 1 below, should we wish to compare our Control group results (G1) vs Palpation + History (G4) in the category of Very Accurate (within 15mmHg of True SBP), we find the proportions involve 22.95% or 14/61 in Control (G1) and 80% or 48/60 in Palpation + History (G4). The corresponding Chi- squared statistic is 39.4 with a p-value of offering a resounding confidence in saying that Palpation + History markedly increases the proportion of Very Accurate estimates over and above the proportion of the same in the Control. We can similarly compare percentages on a number of other comparisons of Groups over several Categories, but we do emphasize such comparisons are not always independent. Nevertheless, we offer the p-values for the data we have, and a modest Bonferroni argument could be used when comparing proportions over related tests. To keep the discussion standardized we report percentages (%’s) in the tables for easy comparison. Assessing Clinical Utility: for the group Palpation (G2), the Estimated SBP is within Clinically Acceptable limits 90.31% of the time, and with the addition of history, this rises to 96.67% of the time. We believe this answered the second primary endpoint, is the accuracy afforded by palpation of clinical relevance and utility. While the authors judge this accuracy to be clinically useful, clinical decision-making is a multi-faceted and individual process. Assessing Clinical Risk: did palpation reduce the risk of dangerously under-estimating a high SBP, or dangerously overestimating a low SBP? The following table shows the distribution of over-estimates within an unacceptable range (Table 2). Palpation markedly reduces the proportion of unacceptable over-estimations, from 36.05% down to 4.83% (p value G2 vs G1 =0.00001). Chi-squared analysis statistically confirmed the lower proportion of unacceptable over-estimates in the groups with palpation (p value for G2 & G4 vs G1 & G3 =0.000039). Table 3 explores the potentially dangerous situation of falsely estimating a low SBP (<80mmHg) to be closer to the normal range (Table 3). As expected, the frequency of the SBP being less than 80mmHg under general anaesthesia was small, so we had to combine groups 1 and 3 (non-palpation) and compare with groups 2 & 4 (palpation). The proportion of dangerous overestimations was significantly lower (p-value=0.000486) in the groups allowed palpation. Under-estimation of SBP was similarly enhanced by palpation, particularly reducing the frequency of "unacceptable" estimates (Table 4). Clinically unacceptable under-estimation fell markedly from 47.54% in the Control group (G1) to just 1.67% in the estimates in Palpation & History (G4)) (p-value< 0.00001). The accuracy improvement with History alone (G3) was much less pronounced, with 31.04% of estimates in this group unacceptably underestimating the SBP. Chi- squared testing showed the palpation groups (2 & 4 vs 1 & 3) had statistically significantly fewer episodes of under-estimation (p-value< 0.00001). With regard to which groups might be better avoiding a dangerous under-estimation of a very high SBP, we were unable to perform chi-square tests because the number of patients with a very high SBP under general anaesthesia was too small. Palpation significantly increased the reliability of estimates of blood pressure, markedly reducing the frequency of overestimation and almost eliminating the risk of unacceptable under-estimates. Providing available history significantly improved accuracy of estimation, and additionally feeling the pulse further improved accuracy such that 96.7% of estimates were within the clinically acceptable range. This would be the situation in the operating theatre. Subanalysis by level of training and experience of the participant and their self-confidence failed to demonstrate a statistical impact on estimates of SBP. The clinicians in this study estimated the SBP of adult patients under general anaesthesia within a range which they had helped classify as "clinically acceptable", 96.7% of the time. By feeling the radial pulse and with access to patient history they came within 20mmHg of the True SBP in their estimates 86.7% of the time. Brief palpation of the radial pulse enhanced estimation accuracy more than having unlimited time and clinical information prior to making the estimation. It didn't matter how experienced you were, nor whether you considered yourself a good estimator. The reason for superiority of brief palpation over extensive history is not clear. When palpation was part of routine care, repeated practice would have honed skill, but clinicians haven’t relied on palpation as a guide to blood pressure estimation for some decades, judging by publication frequency When palpation was routine, accuracy was expected and even the diastolic blood pressure was said to be accurately assessable by palpation . Combined with clinical information mimicking conditions of anaesthesia provision in theatre, these clinicians made estimates which they a priori had considered clinically acceptable. Despite skepticism, they safely estimated the systolic blood pressure of anaesthetized adults by palpation of the radial pulse to within 30mmHg 96.7% of the time, if they were familiar with the patient's past and recent history. Most previous publications on the method of palpation have compared it to auscultation, with both techniques using a sphygmomanometer [14,15]. The three previous publications on the accuracy of palpation alone against a standardized non-invasive device have been performed on awake patients. While all of these studies have shown relative accuracy of estimation by palpation, all involve smaller numbers of estimates than this study. There were no wildly inaccurate estimates at the hypotensive or hypertensive ends of the spectrum under these conditions. This was of necessity an unblinded study, although all participants were "blinded" to the true SBP. One investigator collected all the data, and the analysis was undertaken by a third party. The patients came from an inhomogeneous population of adults having a variety of surgical procedures. As such, the results can be expected to apply to similar conditions of controlled general anaesthesia in adult surgical patients. It might not be wise to extrapolate the accuracy of estimation to more unstable or emergency situations, despite the fact that there were no dangerously inaccurate estimates at either extreme of the SBP scale in this study nor in others. Does estimation by palpation provide us with the range necessary to alert us to danger? If all we want is relative accuracy and safety, has it been achieved? Palpation of the anaesthetized patient’s pulse at the wrist provides immediate access to an estimate of the patient's blood pressure within clinically relevant ranges. Coupled with knowledge of the patient’s history, this study showed that clinicians in the operating theatre can make an acceptable assessment of the patient's blood pressure 96.7% of the time, while awaiting confirmation from a regularly serviced, automated device. This is the only study of which we are aware where clinicians have attempted to make this estimate in anaesthetised patients. It lends credence to claims of accuracy in estimating SBP by radial arterial palpation. The authors would like to thank medical and nursing colleagues in the Department of Anaesthesia at the Royal Perth Hospital for their assistance with the study. Scordo K (1983) Using radial artery palpation to monitor blood pressure. Dimensions of Critical Care Nursing 2(2): 75-79. Gwee AL (1980) Palpatory estimation of blood pressure. Singapore Medical Journal 21(2): 531-533. Cole F (1952) Estimation of blood pressure by arterial palpation. Nebr State Med J 37(6): 190-191. Deakin CD, Low JL (2000) Accuracy of the advanced trauma life support guidelines for predicting systolic blood pressure using carotid, femoral and radial pulses: observational study. BMJ 321(722): 673-674. Rourke MF, Pauca A, Jiang XJ (2001) Pulse wave analysis. Br J Clin Pharmacol 51(6): 507-522. Brien E, Mee F, Atkins N, O'Malley K (1993) Short report: Accuracy of the Dinamap portable monitor, model 8100 determined by the British Hypertension Society protocol. J Hypertens 11(7): 761-763. Beaubien ER, Card CM, Card SE Biem HJ, Wilson TW (2002) Accuracy of the Dinamap 1846 XT automated blood pressure monitor. J Hum Hypertens 16(9): 647-652. Avolio AP, Butlin M, Walsh A(2010) Arterial blood pressure measurement and pulse wave analysis - their role in enhancing cardiovascular assessment. Physiol Meas 31(1): R1-47. McCluskey B, Addis M, Tortella BJ, Lavery RF (1996) Out-of-hospital use of a pulse oximeter to determine systolic blood pressures. Prehospital and Disaster Medicine 11(2): 105-107. Elseed AM, Shinebourne EA, Joseph MC (1973) Assessment of techniques for measurement of blood pressure in infants and children. Arch Dis Child 48(12): 932-936. Struijk PC, Mathews VJ, Loupas T, Stewart PA, Clark EB, et al. (2008) Blood pressure estimation in the human fetal descending aorta. Ultrasound Obstet Gynecol 32(5): 673-681. Bland JM, Altman DG (1986) Statistical Methods for assessing agreement between two methods of clinical measurement, Lancet (1)8476: 307-310. Vaidya JS, Vaidya SJ(1996) Diastolic blood pressure can be reliably recorded by palpation. Arch Intern Med 156(14):1586. Putt AM (1966) A Comparison of blood pressure readings by auscultation and palpation. Fall 15: 4.